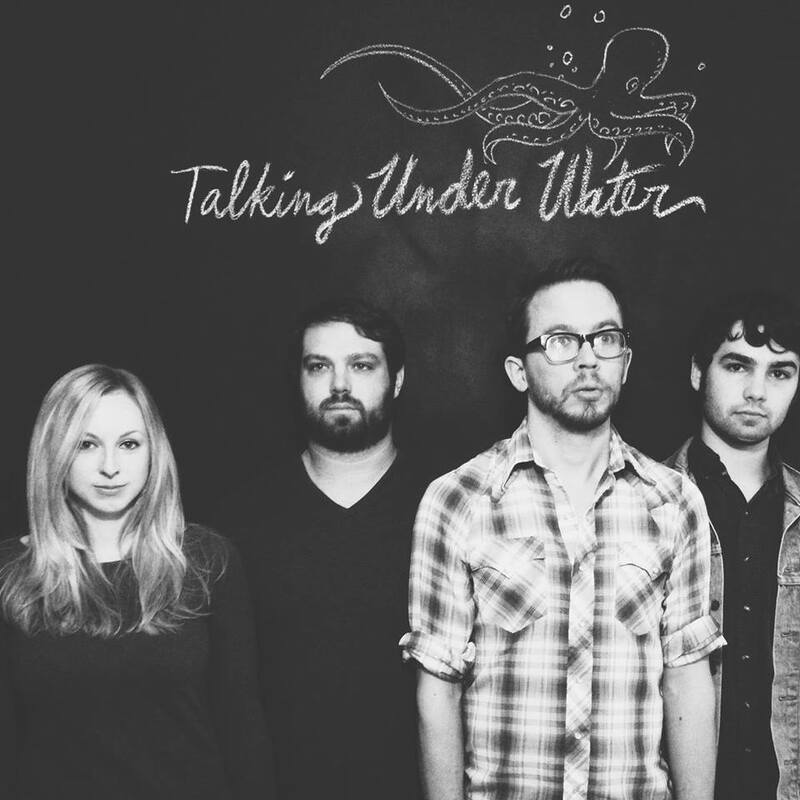 New-York’s Talking Under Water are releasing their new EP “Tossing & Turning” next Tuesday, December 2nd. (listen to the title track single above) The eclectic collective will be making this compilation available both digitally and by cassette tape. Yes, you heard me, cassette tape; they’re bringing it back. Let’s talk a little bit about the EP, shall we? Tossing & Turning begins with the title track, and honestly that track is probably my favorite. The whole EP is amazing but I get goosebumps every time on this one. If you were to ask me what the song were about I’d probably give you a different answer than what you’d expect, because as you’ll find out below the band leaves their lyrics for open interpretation. (mysterious) This track has a ton of dynamic and it is very well-written in my opinion; they make great use of bluesy piano chords, gang chants, fuzzy/clean vocals, fuzzy guitars, bluesy guitars, a CELLO, good beats, and a really awesome and fitting guitar solo. The EP in total holds four amazing tracks (Tossing & Turning, The Sun Sets, Never Been, and My Song) and every single one of them had my undivided attention throughout. You can tell the band spent a lot of time stepping back and developing each one of these songs to perfection. Each track is very emotional but also very thought-provoking and very addicting. I couldn’t help the feeling of wanting to know more, so I connected with their lead singer, Dave Chisholm. We talked about how their music translates to a live performance, how they came up with their sound, (for instance, why did you think it was a good idea to incorporate these instruments specifically??? Genius) what it’s like working/playing with Grammy Award-winning sound engineer & drummer Stephen Roessner, why their passionate about writing sad songs, and much more. Dave Chisholm: “My biggest musical influence!? As in JUST ONE person? That’s impossible. The list of influences is way too big. If I was to narrow it down to one category, I’d say the people who have had the greatest impact on me are the people I have played music with over the course of the 15-odd years I’ve been playing music professionally. They’ve sculpted my taste and turned me on to great music more than anything else. Dave Chisholm: “Steve is great–really fantastic dude and musician. Great drummer, brilliant and INCREDIBLY fast-working recording engineer/producer. We’re lucky to have him in the band for sure. Alex, our guitar player, is also a very talented engineer–he recorded all of the guitars at a cabin in Conesus, NY. When we all heard the guitars on “Tossing & Turning” we all just about died. They were just perfect for the song, loose, angsty, bluesy–I can’t say enough great things about them. Again, we’re lucky to have them both. They are way more perfectionist than I am when it comes to this stuff, and for that I’m super grateful. Dave Chisholm: “We are working on a video for “Tossing & Turning” and it is looking SO great. Our extremely talented friend Will Graver is directing it and we have some friends who are going to act in it. I think it’s really going to be special! Dave Chisholm: “Initially, we only wanted to put this out digitally–it’s only 4 songs so it felt maybe a little bit silly to manufacture boxes and boxes of cds for such a project. However, we felt like we still needed something physical to sell at shows since people are reluctant to buy download cards at events. Vinyl is super expensive to produce, and tapes are small, still somewhat novel, they have a cool sonic character, and it’s easy to package them with download cards, so people can still have the high fidelity of the download with the fun physical product. We are also able to do short runs of tapes. With replicated cd’s, I think the minimum cutoff is something like 500. It just felt unnecessary for this project. We’ll hold off on that until we do a full-length hopefully sometime late 2015. Dave Chisholm: “hmm. Both Steve and Alex are involved in other rock/pop projects. Talking Under Water is very different and in a good way. They’ve incorporated good use of very opposite techniques and blended them into a sound that is very complimentary. You can find more of them on their Facebook!